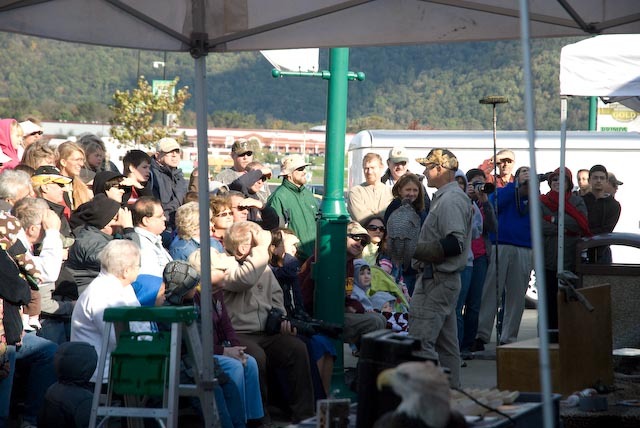 On October 15-16th, 2011 Nikon Birding teamed up with Hawk Mountain and Cabela’s to host a blow-out weekend focusing on raptors. 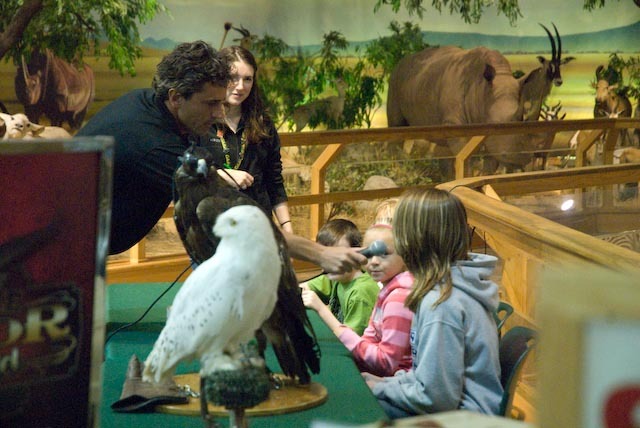 This weekend was meant to draw kids into the Hamburg, PA Cabela’s to experience birds in a up-close and personal kind of way. Those of you who have read my posts in the past know that I am very fond of getting young kids into birding. Although, I don’t want to see them just “Get” into birding so much as I want them to find other young, like-minded kids to communicate with. Building relationships for these young people will prove to enhance their futures in the outdoors. Adrian Binns (Nikon Birding ProStaff and Wildside Nature Tours) brought up two vans of children from the Philadelphia area for a chance to experience all of the activities and be filmed on camera. James Currie from Nikon’s Birding Adventures TV was present filming all aspects of the weekend. Crowds in the hundreds (full of children) gathered as James Currie hosted his own quiz show of sorts. Dozens of children tried their luck at dropping a raffle ticket into a box for a chance to be filmed this weekend. Once each day of the event, James pulled four tickets from the box and those four kids sat on a quiz panel as hundreds watched and the camera rolled. The kids chosen from the crowd were so excited and the kids that weren’t were anxious enough that I saw some seriously disappointed faces. Most of the times we don’t want to see that but I felt like it was a sign that the kids truly were excited. These kids must have felt as if they were on Jeopardy or something. The cool thing was that Jonathon Wood of The Raptor Project had a number of birds present and he would present many different facts about each species. He would talk about one bird at a time and then afterwards the questions were based on what Jonathon had said, so all the kids had to use was their keen hearing to listen for the answers. The Raptor Project is a huge draw no matter where Jonathon Wood shows up. 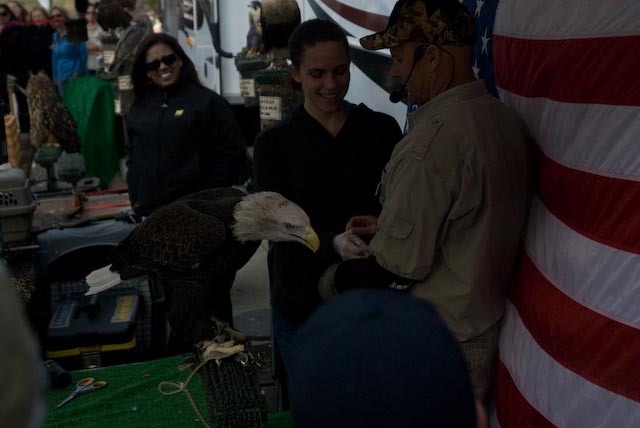 He is consistently on national television, state fairs and birding shows all over United States. 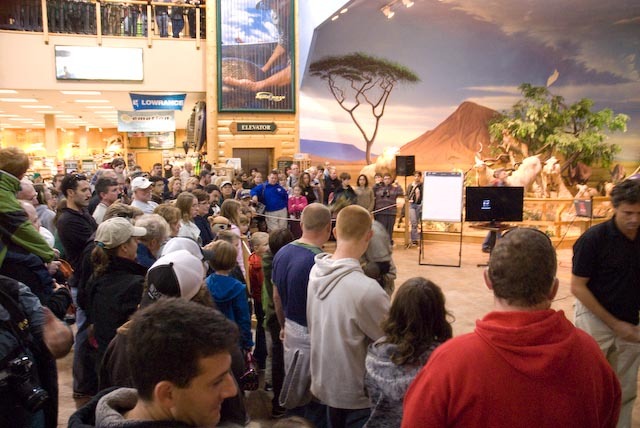 His witty show captivates crowds into the hundreds as can be seen on the photo above. However, the show was happening on the ground while there was another show going on in flight. Although, this weekend isn’t the overall peak for all raptors migrating over Hawk Mountain it was the peak for Accipiters. You could stand on the South Lookout on Hawk Mountain and see a couple dozen Accipiters (mainly Sharp-shinned and Cooper’s Hawks) stream by on the wing in just 15 minutes. This was great practice for those who don’t often see these birds in numbers, like myself. I was busy with the weekend activites and was unable to bring my camera onto the mountain so I poached a few from Nikon Birding ProStaffer, Bill Schmoker’s catalog. 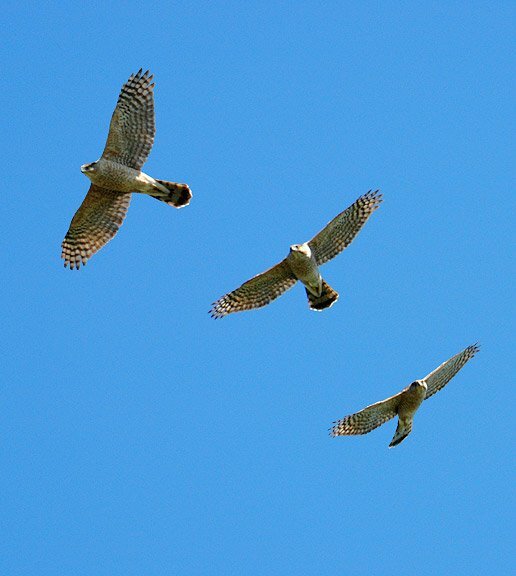 These flight shows emulate what each birder would be experiencing through mid-October at Hawk Mountain. 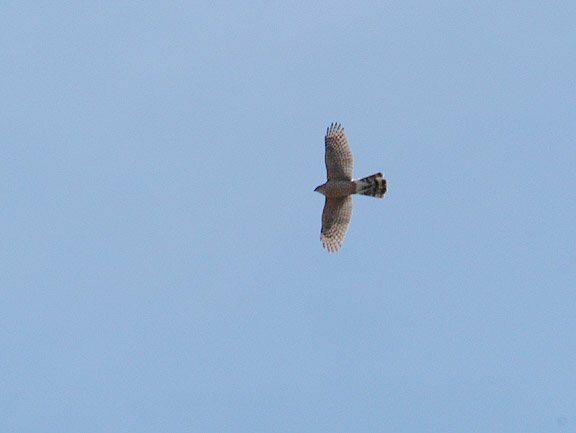 This Cooper’s Hawk above shows long, broad wings and rounded tips to the tail. Now, the tail tips are only about 80-90% effective like most other Accipiter attributes so it is always important to look at a number of key points of ID. If the bird does not looked stressed in flight (for example, due to weather) you can use the head projection of the bird as a clue. This great composite put together by Bill Schmoker of this Cooper’s Hawk shows the head projected farther out from the leading edge of the wing then one would expect on a Sharp-shinned Hawk. What can you notice about the tail of this bird? The uneven tail bands are usually a dead giveaway for Coop’s. It is hard to distinguish this Sharpie’s head projection, but the view of the tail is good enough. The edge of the retrices look to be a sharp 90 dg. angle which usually demotes Cooper’s Hawk from the equation. 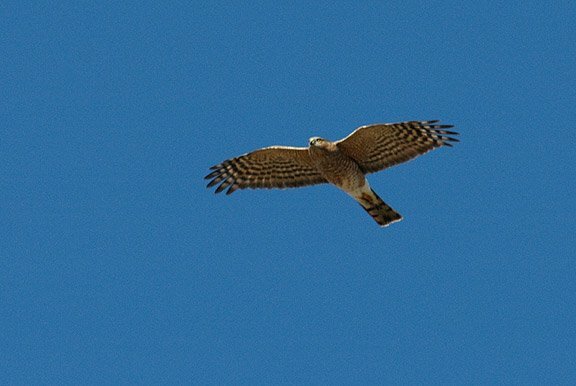 In person, because most Sharpies are smaller (outside of large females) they have faster wing beats than the Cooper’s Hawks. My Uncle John Freiberg recently told me if you can count the wing beats on an Accipiter than it usually is a not a Sharpie. With all this activity on the mountain there was plenty for birders to latch on to. From the Accipiters on the mountain to the crowds below it, the weekend was jam packed and I encourage everyone to get to Hamburg, PA next October for all the fun. Cheers and Good Birding! Super cool event! We as birders need to do lots more stuff like this. Not necessary, just come to my place and see a giant redtail on my building and terrace and sweep piles of feathers and bones off the premises. Last Spring probably that same bird was in the bluejay nests eating the babies, right across the road. twice. And real closeup in a field nearby two perigrines thinking about a meal of my two small dogs running freely. In definite attack mode as I ran towards my dogs the killer birds uplifted. Nearby at a local grocery located hillside another pair of predator birds targeted a bird in flight and the attack was quick the unfortunate creature was downed like a balloon losing air. And the baby squirrel my dog found perfect but dead and curious about why, I searched and saw a juvenile redtail perched branchwise who was not in the least interested in eating it, the predator just cruised off. And the scarce woodpecker whose sound is rare these days just silenced and carried off. Hawk mtn is your backyard. Perhaps it’s unlikely that anything I could say would change your mind, but I would suggest to you that you go to the Hawk Mountain website, or the Audubon Website, or a local chapter of any birdwatching group and try to read and learn about Raptors. Thankfully, there are many people in this country that understand that the conservation of these magnificent birds is very important, and that teaching our children about how tenuous the balance of nature is, will ensure their existence. While it is never an easy thing to see any creature killed….be assured that these birds do not kill for sport. They mate and raise young, and the struggles to survive are often insurmountable. Yes, they may raid a Blue Jay nest, or kill another bird, or attack a squirrel….just as a Blue Jay or squirrel might eat the eggs from a bird’s nest…as well as smaller birds killing insects, moths, butterflies etc. All to survive. Raptors have a very important place in Nature. Something else to think about…if your dogs were not domestic and not fed by a human, they would have to hunt and kill to survive, as well. Lastly, your opinion is yours, but this is a site that was dedicated to showing the results of an informative weekend with an emphasis on teaching children about these wonderful birds. It would be unfortunate to have a child that was excited about Raptor Conservation after attending the show, read your post, and be misinformed. Your empathy for the birds and the squirrel in your post gives me hope that you might consider doing some research that would enable you to maybe look at the Raptors in a “different light”. Thanks for your responses. My thoughts are that we wouldn’t have this wonderful circle of life if there were no competition amongst the hierarchy of the food chain. This is certainly why humans have done as well as we have. After studying raptors and all birds alike in my lifetime I know for a fact that raptors kill solely for survival and never kill for fun unless trained. Wild birds are obviously not trained, thus meaning they search for prey to raise successful young. Some of my most memorable moments have been watching a raptor stalk it’s prey much like a lion would on the Serengeti. Everyone is entitled to their opinion and we appreciate you sharing yours here. Witch Hunt or Just Prosecution?